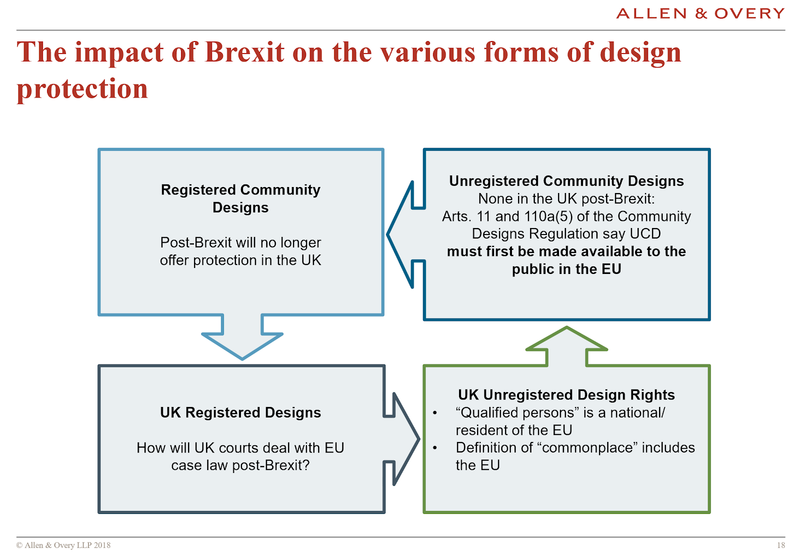 Home / Alicante / Brexit / Civil procedure / Community designs / designs / EU / injunctions / invalidation / procedure / Complicating designs: whither the EU reforms, and what impact will Brexit have? Complicating designs: whither the EU reforms, and what impact will Brexit have? David Stone recently shared his wisdom on the current and anticipated EU designs law changes with IPSoc members. IPSoc is the society for junior IP lawyers in the UK, you can find out more about joining IPSoc here. The current legal framework for designs in the EU dates back to 1998 (the Design Directive) and 2001 (the Community Design Regulation). When the Regulation was introduced, the law was completely new. In practice, it was a combination of the law relating to designs of the 14 Member States (at that time) who had designs law within their national systems. 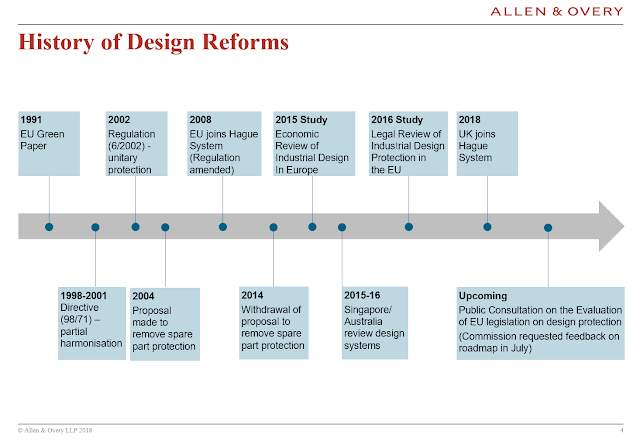 For readers wondering what led to the design reforms and what happened next, David's handy summary of the history of the EU designs reforms is below. has achieved its objectives including efficiency, relevance and effectiveness. if not provide the basis for modernisation and other improvements. Eventually, the reviews may lead to possible amendment of the legislation. The results of two reviews were published in mid 2016. The economic review and legal review are available online. The public consultation feedback phase will start shortly. Biscuits - Biscuits Poult SA v OHIM (T-494/12). We were reminded that the only relevant sense to design law is sight. Although designs explicitly protect texture, what is protected is the appearance of texture and not the sense of touch from feeling the texture. The biscuits decision is particularly interesting from the point of view of protecting the visual appearance of a design in normal use. As the biscuit's chocolatey innards were only revealed upon the peckish person taking a bite, the General Court concluded that chocolate filling did not relate to the appearance of the product. You might think that eating a biscuit is precisely its "normal use" but the General Court concluded that biscuits are not complex products (a conclusion at odds with my baking experiences!) and that people don't buy half eaten biscuits (although, as David pointed out this is precisely the image that is often displayed on packaging). Consequently the fact that the chocolate filling was visible after taking a bite was not relevant as it did not concern the outer appearance of the biscuit. Earlier designs for chocolate chip cookies (and similar) easily invalidated the biscuit design on the basis that they had the same overall impression. This decision was given particular attention in the legal review as it raised issues with many similar food products such as cakes and sausages. As noted above, only the sense of sight is relevant to designs. The consumer is not relevant to designs. Either or both the prior art and the infringement can come from a different field to the design. The informed user is concerned with the design and not the design field of the prior art or infringement. Spare parts is likely to remain a vexed issue for the foreseeable future. National designs are unlikely to be abandoned any time soon. The outcome of the various reviews may be some consistency on the graphical representation requirements. E.g. allowing more than seven representations would give more flexibility when using designs as the basis for filing in other countries which don’t allow dotted lines such as China. One of the big problems with designs in the EU is the inconsistent application of procedure. For example, Germany regularly gives ex parte injunctions in design cases. By contrast, the English High Court has issued no ex parte injunctions in the last 10 years. This means that whilst the law is theoretically the same, the implementation is very different across member states so forum shopping is inevitable. Another issue concerns available remedies. For example. France doesn’t offer declarations of non-infringement, so it is not possible to get a declaration of non-infringement against L’Oreal - which is domiciled in France. User groups are trying to present a unified front in order to improve the prospects of their proposals being considered. For example, ECTA, INTA and MARQUES published a joint paper on the issue in July 2018. What will happen to the courts? The Community Designs Courts will disappear from the UK and cease to have pan European jurisdiction. Unlisted cases are unlikely to be heard before 29 March 2019. So it may be that when you get an injunction for a Community Design is will only cover the UK. While the deal may include a requirement that any existing injunctions would apply both ways, in the absence of such a deal, existing injunctions from the English Court would likely apply to all Member States apart from the UK. Similarly, an injunction obtained on a Pan-EU basis from a Member State court such as Germany would not apply in the UK. That said, anyone who tries to relitigate an injunction is unlikely to be met with judicial joy and may be heavily penalised in costs. After 29 March - English judges can take or leave CJEU decisions as they please. The judges have asked for better guidance than that. Until there is clarity on this issue, there will be a lot of short term uncertainty which is less than ideal for business. The current view is that references to the CJEU which were made pre-Brexit will continue to be binding and rights of audience will remain pending the outcome of that matter. If designs have been filed but not published, the UKIPO cannot access images and therefore cannot clone it. These businesses have the right to refile in the UK and take the earlier publication date but to avoid any problems they should ideally publish well in advance of B day. Cloned rights last for a maximum of five years in line with the renewal date of the Community registered design. If people pay the renewal fees they will become UK registered designs. The UK will recognise unregistered Community Designs for the period of their pendency (i.e for the remainder of the three years). There will be a new UK unregistered design which will last for three years provided first publication is in the UK. Publication is a real issue for the future because first publication is linked to the availability of both Community Designs and the new UK equivalent to Community Designs. Telecast shows from London, Paris and New York fashion week may be sufficient to qualify but there is a very slight delay in telecasts and it is unclear whether this is sufficient to deny first publication. Solutions such as a private showing followed by a global broadcast are unlikely to be practical solutions given the number of NDAs required. Is it too easy to get a design? There are two main approaches to designs around the world. A deposit system where you have a dispute about the design's validity if you try to enforce it - i.e. the EU system. A full prior rights examination on filing - i.e. the US system. Alicante torpedos are a common problem faced by many a design owner when they try to rely on a design. Essentially, a design owner applies to invalidate the design at EUIPO and the national courts cannot consider the right for infringement purposes until EUIPO has made a decision on the rights' validity. As this decision can be repeatedly appealed, it can hold up the design for many years. You can avoid an Alicante torpedo by issuing proceedings - you do not need to serve them in order to be protected so there is still room for pre-action negotiation and compliance with the relevant pre-action protocols. By contrast, the problem with the German court's willingness to grant ex parte injunctions is that the court is not given prior designs, taught design freedom or technical function. This means that they are making a decision with far reaching consequence without giving the opportunity for a right of reply or full consideration of the relevant issues.